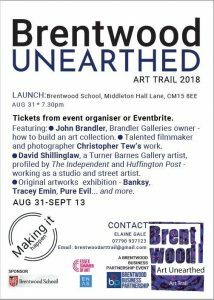 Attend the launch of Brentwood Art Unearthed and the Brentwood Art Trail – a Brentwood Business Partnership initiative. As part of this evening there will be a rare opportunity to learn about how to build an art collection from knowledgeable local gallery owners as well as gain first-hand insight into the street art scene (aged 16s and up). Seven years ago John Brandler, Brandler Galleries owner, was advising clients to purchase pictures by a young artist for around £300. That individual turned out to be Banksy and John is now a specialist dealer for the enigmatic artist. John, along with other local art dealers specialising in an extensive range of art and exhibiting internationally, will be on hand throughout the evening to give free advice and answer questions about any aspect of collecting art. You can also ask about the services they offer such as sourcing and installing art as well as how to enrol on special, professionally-run creative workshops managed by artist-led Gallery No. 3 in Ingatestone. The evening features talented filmmaker and photographer Christopher Tew’s work and special talks, organised for Brentwood Art Unearthed, in Brentwood School’s lecture theatre. ** Speakers include David Shillinglaw, a Turner Barnes Gallery artist, recently profiled by The Independent and Huffington Post, who will share his experiences working as a studio and street artist ** and John Brandler who will guide you through the tricky business of building an art collection. Afterwards you will have access to a specially curated original artworks exhibition, that includes big names such as Banksy, Tracey Emin, Pure Evil, The Connor Brothers and Sherlock, and have the opportunity to purchase later. Light refreshments will be available. Visit an artist showcase at the Baytree Shopping Centre (inside) Sept 1-2 (10-4pm).